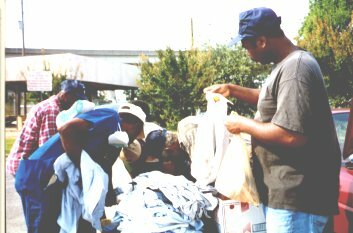 Augusta Street Ministries collects used bibles, blankets and clothing and redistributes them directly to the homeless in the Augusta, Georgia area. The homeless situation in our area is very bad, and the folks we minister to have no place to sleep and are often lucky to get even a single meal a day. For this reason, we pass out sack lunches whenever possible. Every sack lunch contains a sandwich, a fruit drink, a bag of chips or crackers, a sweet roll, a napkin, and a Christian tract. Frequently the recipients will sit down right where they receive the lunch and start eating the sandwich and reading the tract. In addition to sack lunches, we also pass out personal hygiene kits. The personal hygiene kits include a toothbrush, toothpaste, a disposable razor, a bar of soap, a band-aid, and whenever possible such items as aspirin, vitamin tablets, and deodorant. Being able to shave, brush their teeth, and get cleaned up is important for these homeless folks to find work. The personal hygiene kits are very popular, and always welcomed. Just as important as being clean themselves is having clean work clothes to wear. For this reason, every visit includes a supply of clean pants and shirts which are made freely available. Usually we take a variety of clothing including both street clothes and uniform work clothes. Socks, caps, and shoes are also very popular items that are badly needed. 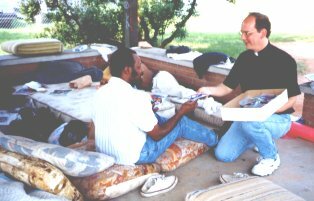 Shoes are an especially difficult item to provide, as they aren't donated as often as the other items. 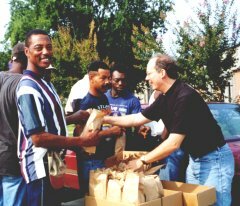 Whatever is donated, however, is taken to the homeless and given to them freely and unconditionally. No visit would be complete without sharing prayer with these desperately needy folks. Here, this man requested prayer that he would find work and be able to stop living on the streets. The young lady requested prayer that she would be able to find a place to live, and that the child she was carrying would be delivered safely and born healthy. Homelessness is especially difficult for an expectant mother like this one. Prayer requests typically center around such basic necessities as having something to eat and a place to live. When a child's parents are homeless, the child becomes homeless also. This little girl and her mother are both homeless and living on the streets. On this day we were able to provide some food and clothes for the family, and a coat and a few toys for the little girl. This family has begun attending church with us at Calvary Baptist church, where many of our volunteers are members. We are currently praying that they'll both become members and be baptised into our church. This photograph shows where some of the homeless in our area sleep. This is a row of mattresses under the John C. Calhoun expressway overpass. As you can see, the railroad tracks run right through the sleeping area, and trains run through there at all hours, both day and night. Imagine trying to get some sleep while a loud train is running just a few feet away. By the way, most of the blankets you see in this photo were donated by local motels, and delivered by Augusta Street Ministries. Here's what it's all about, the moment when someone will accept a free bible. This young man is cleaned up and ready to go to work! 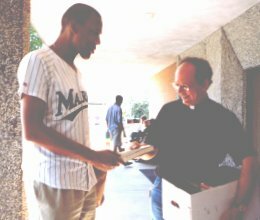 Now, with a bible, he's fortified with the Word of God, which is so important in getting the homeless off the street and back on their feet. While small, pocket-sized bibles are the most popular, bibles of all sizes are welcomed, and some homeless have a particular need for the larger print versions, if their vision is bad. Often, those who need glasses have lost them and can't afford to replace them. Bibles are always a blessing to anyone who receives them. There's a constant need for used bibles, blankets, and clothing.